Swisher County is a county located in the state of Texas. Based on the 2010 census, its population was 7,854. Its county seat is Tulia. The county was created in 1876 and later organized in 1890. It is named for James G. Swisher, a soldier of the Texas Revolution and signer of the Texas Declaration of Independence. In 1876 the Texas state legislature carved Swisher County from Young and Bexar districts. 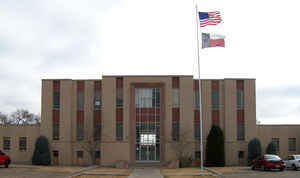 The county was organized in 1880, and Tulia, became the county seat. The county is named for James G. Swisher, a soldier of the Texas Revolution and signer of the Texas Declaration of Independence. Donald R. Abbe and John Leffler, "SWISHER COUNTY," Handbook of Texas Online (http://www.tshaonline.org/handbook/online/articles/hcs18), accessed January 24, 2016. Uploaded on June 15, 2010. Published by the Texas State Historical Association. As reported by the Census Bureau, the county has a total area of 901 square miles (2,333 km2), of which, 900 square miles (2,332 km2) of it is land and 0 square miles (1 km2) of it (0.03%) is water.